Everyone wants to join a party that's memorable, fun and over the top - and you've just received your invitation! Join Mr. Sloto as he throws the sweetest party of wins: Sweet 16! Jellybeans, wine gums, toffees and all sorts of candies adorn the 5 reels of Sweet 16. The lollipops are the scatter symbols in this game and will trigger the free spins. This fun all ways-pay slot will have you continuously winning with the unique structure of winning symbols morphing into new ones for even more winning opportunities! 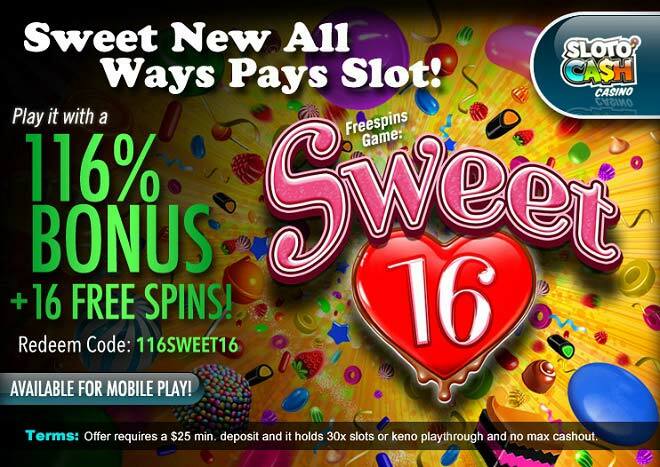 Get your sweet tooth ready and your party hat on when you deposit as little as $25 to play our new Sweet 16 slot with a 116% Match + 16 Free Spins!